All the crocuses in the fields are gone now. The daffodils are at peak blooming however some fields are not in bloom yet. I photographed the daffodils last week an shot a short video of the blooming status. Have a look here. The early tulips are in bloom and the regular tulips are about to bloom. Just a couple of days with these warm and sunny weather and we can see some fields turning from green into color. And the hyacinths are in bloom as well. Numerous fields are dotted around the area. All the purple, white and pink colors are coming from these fields. I made a short video of them as well. Have a look here. Some people let me know that they were a bit disappointed while visiting the fields. There are a lot of fields in bloom but they are slightly further away from the Keukenhof than previous years. I made a quick map for all of you visiting by car / renting a bike to see these fields in bloom. Be aware this is the present status, some fields might be done blooming when you visit them in the next weeks. Click to see the map with the blooming flower fields. The crocus are at peak blooming or just over peak blooming, the daffodils are in bloom, the early tulips are in bloom, the hyacinths are blooming and de regular tulips are still green. They need some extra sunshine and warmth this week. The indoor tulip festival is at peak/over peak blooming. And make sure you visit the other flower shows too, they look wonderful. Keukenhof is starting to look less green and more color. Around the bulb statue the tulips are in full bloom. And around the park you can see more tulips. The next weeks till the end of April the Keukenhof is getting more and more beautiful. Hai,we are planning to visit tulip garden(keukenhof & surrounding tulip fields this weekend 18-19th april.Is the tulips bloomed or not, in the fields?Can you please tell which will be the nice place to take photographs with these tulip fields. please reply.Thank you. Hi Martin, as mentioned in the flower update above, the early tulips are in bloom and the regular tulips are about to bloom. Please click on the link for a map of the flower fields. Enjoy your stay in the Netherlands. Hi Heather, it is a difficult choice one at the beginning and one around the end of blooming. At the 19th you will see also hyacinths and daffodils in bloom at the flower fields and gives you more color. They will be sure gone by the first week of May. I can’t predict the impact of the sunny weather the tulips can come up quickly to peak blooming and there is a possibility that the fields are headed (or going to be headed). The Keukenhof will look beautiful. Inside the Keukenhof the tulips won’t be headed after peak blooming. If you love fields of flowers visit earlier, if you like Keukenhof I would wait till May 1st. Have a lovely trip to the Netherlands! Thank you, Nienke. I just booked my trip for the 19th. Looking forward to it! Wishing you a wonderful trip to the Keukenhof and flower fields! Enjoy! Hi Tom, the tulips at the Keukenhof will be there. At the fields it is not sure. They are just starting to bloom and the tulips will be headed just after peak blooming. Lots of fields are still green now, but with the sunny weather in the next week it is a bit hard to predict when they reach peak blooming. Keep an eye to the weekly updates. I am planning to visit on the 29th, will it be too late for the garden. Also will the fields get headed by then? Hi Ray, If you mean the 29th of April you will be fine. If you mean the 29th of May there will be no tulips left. This is so much helpful!!! I’m going on the 30th of April. Do you think there’s still a chance to the flower fields? You’re welcome. There are still some fields left that are not yet in bloom. Big chance that you will see some fields in bloom. You might need to rent a bike to see them. Keep an eye to next weeks update to see where they are in bloom. I really appreciate your blog because of its useful informations. I have 3 dates; 18/4, 24/4, 28/4 and don’t know which is best day to see tulips in bloom ( Also the tulips Fields ). Could you please give me some advices? Thank you very much and keep up your works.Bravo! We are looking at coming the second weekend of May do you think the tulip will still be in bloom? Hi Patricia, that is too early to tell, I can tell you around the first week of May. The second week of May is the very end of spring season. The tulips in the fields will be headed, but you might find some tulips at Keukenhof around that time. But there will be less tulips in bloom compared to the next 2 weeks. Thanks Nienke. will try go and see it earlier thanks for the information! I will be in AMS on the 28th, the day after Kings Day. Will the gardens be crazy crowded? I am hoping colors will still be strong. The last week it is very busy also during weekdays. The flowers are in bloom and everyone wants to see that 🙂 The 28th will be less crowded as the weekend before.If you visit early in the morning or later in the afternoon the crowds tend to be not that busy. Which fields do you recommend to visit between Apr 24 – Apr 29? Hi Boris, see the map in this post. The fields are dotted around the area. I enjoyed reading your site. I wish the Keukenhof website offered regular updates. As of April 20, their “recent news” is still from April 7. I can suggest to your readers that K. looks beautiful even when not at peak tulip bloom. I was there on April 15& 17 and could see some changes from one visit to the next. The Hyacinthe & daffodils also give off a stronger scent than just tulips alone. The structure of the landscape and the flowering trees & shrubs are a big part of the park’s beauty. I just send the weekly tulip update to all the readers of the weekly newsletter and mentioned that Keukenhof looks gorgeous at the moment! Thank you for your message! Have a lovely day! Very interesting to read This page. I have only my smartphone with me and the map you have made is to small for me to ser. Can you write kust one roadname/adress where we can ser tulip fields ? Yesterday we saw hyacint and dafofil fields. Now we only miss to ser fields with tulips. When you drive further on this road towards Noordwijkerhout you will find several tulip fields next to the daffodils and hyacinths fields. The same is for the N208 road between Lisse and Sassenheim and from Sassenheim to Noordwijkerhout. Just follow the roads and when you see something colorful just stop along. Bug chance you are looking to tulip fields. As as Newbie have few questions after reading your blog. 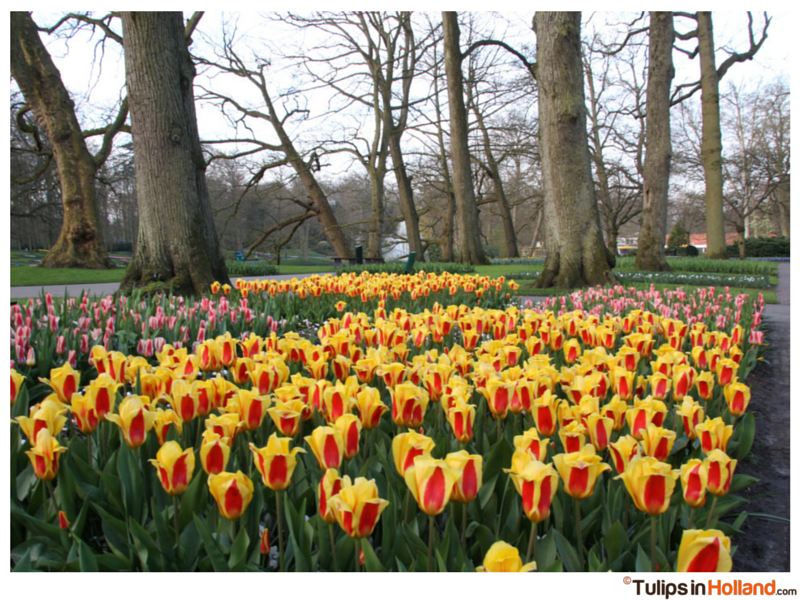 What is the difference between Keukenhof vs Keukenhof Park vs Tulip Fields ? Reason being we are visting keukenhof on 6th May and looking at your previous updates, only 2013 seems to had late spring. So we are worried if we will be able to see anything this year.I will constantly follow your blog but if you can you please tell me what to do in worst case scenario when we arrive and park doesn’t have any flowers. The 6th of May is towards the end of springtime. Keep an eye to the weekly updates and decide last minute if it is worthwhile to travel to Keukenhof. Worst case scenario you can visit the flower market in Amsterdam, Tulip museum in Amsterdam, see the flower Auction in Aalsmeer if you want to do something flower related. Waiting for your Week 17 and Week 18 Update !! !